I make the kale chip coating in the Thermomix, as the high speed of the machine breaks down the lemon very well. You could blitz the mixture in a blender or food processor instead. You can soak the cashews if you wish to help them blend with the rest of the ingredients. I don't bother and still get quite a creamy mixture. I make these in a dehydrator, but I have provided oven dried instructions as well. 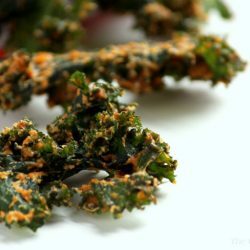 I have not made them this way but many others have success with making kale chips in this manner. Remove the thick central stalk from the kale. I do this by holding the stalk in one hand and running the fingers of my other hand up along the stalk. Some varieties work better than others and you may need to cut some stalks out with a knife. Break the kale into chip sized pieces and rinse thoroughly in cold water to remove dirt and bugs. Dry the kale, either by using a salad spinner or by swinging it around your head in a tea towel. If going the tea towel route, do this outside because water goes everywhere. Place the kale in a large bowl and set aside. If using the Thermomix, with the motor running on Speed 8, drop the garlic clove onto the blade. Turn the Thermomix off. Add the remainder of the ingredients in the order listed and blitz on Speed 6 until you have a smooth, creamy mixture (about 1 minute). If using a food processor or blender, you want to blend until the lemon is well incorporated into the mixture. Pour the cheesy mixture over the kale. Stick your hands into the bowl and massage the mixture through the kale leaves until the leaves are thoroughly covered. Spread the kale chips evenly over the dehydrator trays, allowing space between the kale pieces if possible. Try not to overlap the kale pieces as they will not dry properly. Dehydrate until the kale chips are thoroughly dry and crisp. I usually do mine overnight and they are crispy by morning. Line baking trays with baking paper and then evenly spread the kale chips over the trays. Bake for approximately 45 minutes, until the kale chips are dry and crisp, turning the chips about halfway through the baking period. The baking period will obviously depend on how wet the chips were initially and your particular oven. Keep an eye on the chips, and if they seem to be browning rather than drying turn the heat down. These chips will keep in an airtight container for about 2 -3 days, although I will be surprised if they last that long. They may start to soften if not completely sealed. If this occurs, you can either put them back in the dehydrator or just give them a brief spell in the oven. * I buy jars of char grilled, preserved sweet red capsicums (peppers) from my local Italian deli, and use a whole one in this recipe. I like the mellow flavour the roasted capsicum adds. You can grill your own capsicum (pepper) if you prefer, or even use raw capsicum if you wish. Nama shoyu and tamari are both varieties of Japanese soy sauce. I use them as I find the flavour richer and deeper than traditional soy sauce. If you don't have either then just use soy sauce instead.